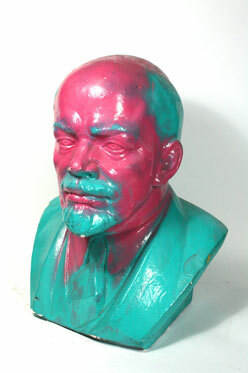 Originally produced in the mid-1960s, this Lenin bust was identical to many others. They were plaster-cast, painted dark to resemble a bronze patina and displayed in public places across the East Bloc. More than twenty years later during the Monday Demonstrations, (a series of peaceful political protests against the government of the GDR starting in Leipzig in September 1989 that took place every Monday), spreading around East Germany which ultimately lead to the breakdown of the communist regime, this icon was spray-painted in pink and turquoise by protesters.